Entertaining guests at my apartment has been a favorite pastime of mine. No thing is better than having friends over, a few cold beers, and freshly grilled meat. Burgers, steak, and chicken, it’s all great. In less than an hour a world class meal can be made by even amateurs in the kitchen. All it takes is one thing, a grill. It’s absolutely beautiful. These days all people are grilling. Not just the classic image of a bachelor with his grill or a dad cooking for his family. Grandmothers, moms, college coeds, and more are finding the magic of grills today. It is no secret though. Grilling with charcoal and propane can be difficult. Starting the coals is a pain, lugging around a propane tank is too heavy for some, and it takes time to learn the ins and outs of the grill. If you have already tried grilling before and found it to not be for you, don’t give up. This is where the electric grill comes in. No charcoal or propane required, just an electrical outlet. The hardest part of owning an electric grill is cleaning it, and even that is simple. George Foreman has been bringing grills to the masses for decades now. Don’t think George Foreman Grills are just for the college dorm room. No, George Foreman now makes a series of affordable standup electric grills. 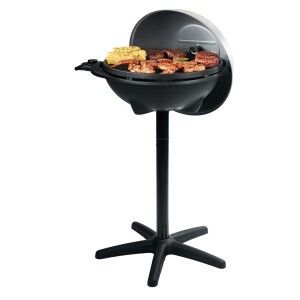 Most cost under $100 and promise to deliver BBQ quality results for any and all who love to grill. I am always eager to see how the George Foreman Company improves upon their products. Before I have already published a review on the George Foreman GGR50B Electric Grill. 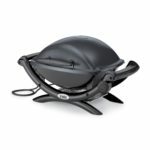 How does the George Foreman GFO240S Electric Grill compare? Pretty favorably. There are a few improvements here and there that will be highlighted in the review below. What we all dread when first getting a grill in the mail is having to build the darn things. With the George Foreman, assembly couldn’t be any easier, honestly. Ever built a Lego set? This is even simpler. Just a few parts that snap together and that’s it! No power tools required. Pieces are lightweight and can be easily put together. Open fire grills are restricted at just about every apartment complex. That leaves grill lovers with only one choice, electric grills. The George Foreman Grill makes a solid choice thanks to its compact design and ease in moving the grill around. All you need is an electrical outlet on your patio terrace and you’re good to go. I’ve go to say, grilling with a George Foreman on an apartment patio does capture a heck of a lot of the traditional grilling experience. Most electric grills can not be used indoors safely. 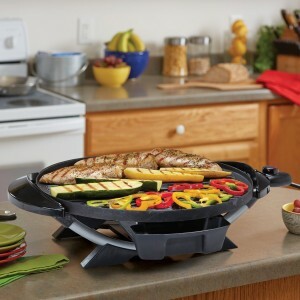 George Foreman Grills are engineered for use indoors or outdoors. 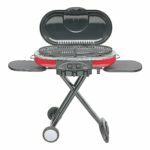 Typically electric grills throw up way to much smoke to ever be used indoors. Not with the George Foreman, it manages to suppress smoke buildups thanks to its drain off drip pan design. What is the true mark of grilled meat? Those black sear marks. I just love the way they look. Honestly, those sear marks are about half the battle when it comes to grilling. The George Foreman builds up heat to near 500° Fahrenheit and it shows. You’ll be able to fool many friends by looks alone with your finished product. If there is one thing I hate about charcoal and propane grills, it is those darn hotspots. Nothing could be worse than biting into a burger and discovering half is well cooked and the other half is rare to medium rare. 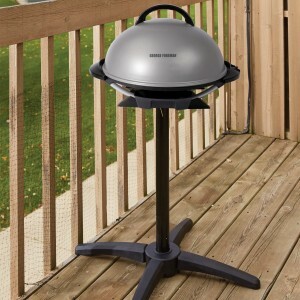 Electric grills nip this problem in the bud as hot spots just never occur thanks to perfectly even heat distribution. Also, anyone that is afraid of grills due to flareups will have no fear when dealing with this George Foreman. No lighter fluid is required and the grill drains off all grease into a drip pan. All the work and maintenance required of charcoal and propane grills scares off many. Electric grills simplify everything to the tenth degree. No more lugging coals and propane tanks from the store. No more playing pit master in the backyard to reach a stable temperature. Just plug the grill in and wait ten minutes for it to heat up. All adults can use this thing, even elderly folk who thought they had to give up their grills after reaching a certain age. Guys, this grill can be used at any home, not just those with grill restrictions. Grilling outdoors on the tail end of a summer evening is one of the great shared experiences of millions of Americans. Just plug this George Foreman Grill into an outlet, and you’re ready to grill. Cook up a few burgers for the family and enjoy living. 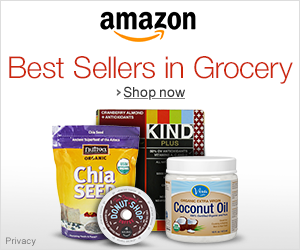 Never run into a problem with dried out grilled meat again. Electric grills retain moisture like a king. Charcoal grills are practically a dehydrator in comparison. All that grease is constantly drizzling off from the meat and running down the pan. In effect, this is just like using a turkey baster. Juicy chicken and fish just can’t be beat. All grills should be as easy to clean as this George Foreman Grill. All grease siphons off into a drip pan that can be lined with tin foil for fast removal. The grilling plate is non-stick and can be simply wiped down with a paper towel to clean up any remaining grease. To get a perfect clean, wipe your grill down after it has cooled off first with a slightly damp paper towel, then with a soapy paper towel. Truly, this is about as simple as it gets. No matter what companies may say, electric grills will never m atch that slightly charred and smoky flavor traditional grills deliver. It’s a real shame; the George Foreman keeps the meat juicy and sears it well, but can’t give it a smokey flavor. My favorite workaround to get that BBQ flavor is to use Smoked Sea Salt. A few dashes of that onto the meat and it comes a whole lot closer to tasting like real BBQ. This George Foreman is not built to withstand the elements. I mean, look at the thing. It balances on a thin pole. If a strong windstorm comes along while your grilling, you better worry about this grill falling over. It weighs less than twenty pounds, that’s nothing compared to a two hundred pound propane grill. Insulation? What insulation? This grill just sheds heat like crazy during those colder months. It takes forever to heat up, and will not reach those maximum temperatures your used to seeing during the summer. Of course you can always take this indoors to use, but I prefer just cooking with charcoal during the Winter. What about other George Foreman Grills? Primarily, this model of the George Foreman costs $20 less than the model being reviewed here. Honestly, you are only getting a few extra bells and whistles for that $20. First off, the GFO240S model has a ceramic finish to it making it far easier to clean. This alone is a great time saver, so I prefer the GFO240S model. Secondly, the GFO240S functions better as a tabletop grill than the GGR50B. Quality between electric grills varies quite a bit. George Foreman grills are on the lower end. They are made of a whole lot of plastic, and use only a small amount of metal. 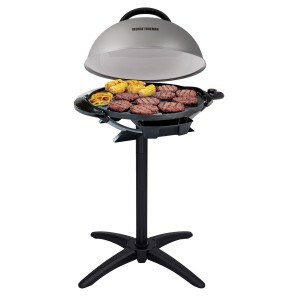 The Weber Q2400 Electric Grill feels luxurious due to its all metal construction. The Weber Grills far more and is even easier to clean up. Need a Grill Truly Designed for Indoor Use? Don’t get me wrong, the George Foreman Grill works great as an indoor grill. However, there are better options out there. For anyone just needing a quick and easy indoor grill, I really recommend the Delonghi Grill. It is compact, easy to clean, and is designed exclusively for indoor use. 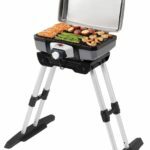 The George Foreman GFO240S Electric Grill functions well as both an indoor and an outdoor grill. I just love how easy it is to clean this thing up, just line that drip pan with aluminum foil and wipe it down with paper towels, that’s it. It just can’t get much easier than this. While this grill is a bit wimpy compared to a heavy duty charcoal grill, it’s not meant to be a power horse of a grill. Overall, I give the George Foreman GFO240S Grill a total of 3.5 out of 5 stars.